HOUSTON -- Authorities on Saturday arrested a suspect in what they're calling the "cold-blooded assassination" of a uniformed sheriff's deputy who was fatally shot while filling up his patrol car at a suburban Houston gas station. Harris County Sheriff Ron Hickman said at a news conference that Shannon J. Miles, 30, had been arrested in the death of Harris County Sheriff's Deputy Darren Goforth. Hickman said Miles was the person of interest who had been with police all day. His exact motive for allegedly killing Goforth was unclear. "Our assumption is he [Goforth] was a target because he wore a uniform," Hickman said. Goforth's death prompted strong statements about the recent climate of tension between civilians, law enforcement and the "Black Lives Matter" movement. "Our system of justice absolutely requires a law enforcement presence to protect our community," Hickman said at an earlier news conference. "So at any point when the rhetoric ramps up to the point where calculated cold-blooded assassination of police officers happens, this rhetoric has gotten out of control. "We've heard Black Lives Matter, All Lives Matter. Well, cops' lives matter, too. So why don't we drop the qualifier and say lives matter," Hickman said. The sheriff added, "I've been in law enforcement 45 years. I don't recall another incident this cold-blooded and cowardly." Goforth, 47, was pumping gas about 8:30 p.m. Friday when a man approached him from behind and fired multiple shots, continuing to fire after the deputy had fallen to the ground. 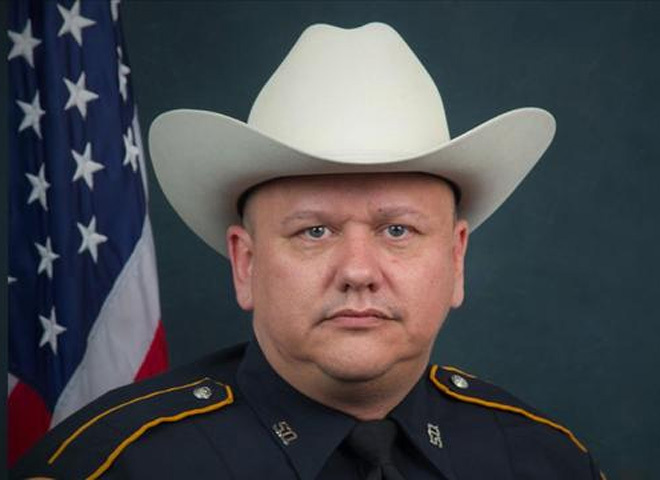 Goforth was working alone, which is common procedure, sheriff's office spokesman Deputy Thomas Gilliland told CBS Houston affiliate KHOU-TV. Goforth was a 10-year veteran of the force, had a wife and two children, Hickman said. As for a motive, Hickman said that until anything is known with "certainty ... it's all speculation" but later suggested that Goforth was targeted because he was in law enforcement. Harris County District Attorney Devon Anderson called on what she described as "the silent majority in this country to support law enforcement." An impromptu memorial sprouted at the pump he had used Friday night, with a pile of balloons, flowers, candles and notes, including one that said, "Gone but never forgotten R.I.P. Deputy Goforth." The gas station was open Saturday, but that pump was closed. Brian McCullar knew Goforth because the deputy had patroled his neighborhood, which is about two miles from the gas station, and the two spoke often.